BRUSSELS, Belgium -- At a European Union-Ukraine summit on November 22 2010, EU leaders will call on Ukraine to give renewed impetus to reform efforts in particular as regards the consolidation of human rights, democratic principles and the rule of law. 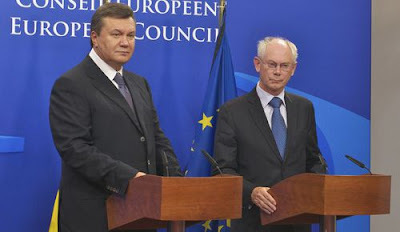 Ukraine's president Viktor Yanukovych, left, at a September 2010 meeting with European Council President Herman van Rompuy. They will urge Ukraine to make further progress in improving the business and investment climate particularly by tackling corruption and removing red-tape, a European Commission statement on November 19 said. They will also welcome reforms in the macro-economic sphere, particularly in the light of Ukraine’s Standby Arrangement with the International Monetary Fund (IMF). They will look forward to Ukraine’s imminent accession to the Energy Community. In the energy sector they will review progress in the implementation of the memorandum of understanding on energy co-operation as well as the modernisation of Ukraine’s gas transit system. The leaders will also discuss the opportunities provided by the Eastern Partnership to promote political association and economic integration between the EU and countries of the Eastern Partnership, the European Commission statement said. The 14th EU-Ukraine Summit will be hosted by European Council President Herman Van Rompuy. The Commission will be represented by EC President José Manuel Barroso. EU foreign policy chief Catherine Ashton will accompany both presidents. Barroso will also be accompanied by the Commissioner for Enlargement and European Neighbourhood Policy, Štefan Füle and Commissioner for Trade, Karel de Gucht. The Ukrainian side will be represented by president Viktor Yanukovych accompanied by foreign minister Konstantyn Gryshenko. "This is our first summit since president Yanukovych was elected earlier this year but overall this is going to be my fourth meeting with the president in one year," Van Rompuy said. "Reform in Ukraine and the EU-Ukraine bilateral relationship will be at the top of the agenda. We will welcome the positive steps taken by Ukraine particularly in the economic and energy sphere. We look to Ukraine’s leadership to increase the reform momentum in these areas and as regards respect for human rights, the rule of law and democratic principles," Van Rompuy said. Barroso said: "Ukraine is a key partner for the EU and an important regional player. The ambitious agenda of this summit reflects our dynamic relationship. "I am pleased that we are able to announce an Action Plan towards the establishment of a visa free regime for Ukraine and that a Protocol will be signed which gives Ukraine access to EU programmes. These are two concrete examples of the EU's continued engagement with Ukraine. We will also take stock of the progress in the negotiations on the EU-Ukraine Association Agreement, which we want to complete as soon as possible. We will stress the need to deepen the process of reform, in particular in the area of rule of law and the business and investment climate," Barroso said.